Koly is a young Hindu girl living in India. When her parents arrange a marriage for her, and her new husband suddenly dies, she finds herself alone, frightened, and having to live with her mother- and father-in-law. 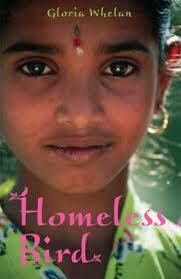 What can you do, when you are thirteen years old, and already a widow? Worse still, when nobody seems to want you? Koly comforts herself by trying to befriend stray dogs and making beautiful quilts to remind herself of her family. She works as hard as she can and eats as little as possible, trying not to anger her mother-in-law. However, one day, when her cruel mother-in-law abandons her in a holy city, Koly must use all of her courage and skill to get by. Add in a kind benefactress, a sari maker who recognizes Koly’s skill with embroidery, and the story is brought to a beautiful and happy ending. The words are simple, and the story is very interesting and quick to read. 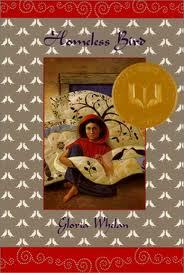 The author, Gloria Whelan, has won many awards, and this book is a winner of the prestigious National Book Award. Totally worth it! Whelan, Gloria. Homeless Bird. HarperCollins: New York, 2000. 240 pp. Ages 9-14. If you liked this, try Breadwinner by Deborah Ellis, or A Step From Heaven by An Na. Posted on March 4, 2011 March 17, 2011 by ShannaPosted in National Book Award, YA LitTagged Historical Setting, Interesting Settings.